Looking for the best way to sell tickets online can be overwhelming. As an event organiser, you may find yourself presented with technical or ambiguous answers to this question, leaving you stuck at square one. As a key customer touchpoint, your ticket buying experience is integral to hitting your conversion rate targets. To save you endless hours of searching, we have compiled the ultimate guide to selling event tickets online. Why try to fit in when your event is custom made? Steer yourself away from templates and preset questions, the secret to success is to take complete creative control of your event ticketing process. Start by identifying your audience. If you’re going after families, reflect this in the design of your offering with the time-saving option to add a ‘family ticket’. Do you want to entice affluent attendees? Consider adding a ‘VIP’ ticket option. The Nutickets software platform gives you endless opportunities to give your customers ticket types that feel as if they were custom built just for them. 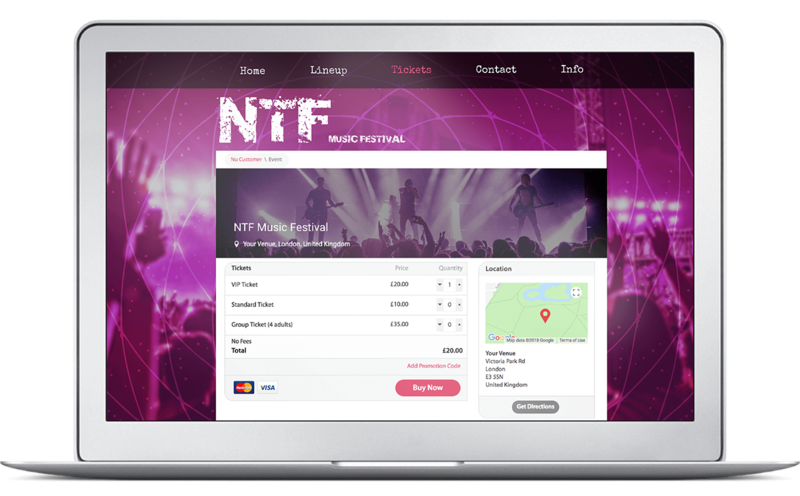 Now comes the fun part, Nutickets offers a fully customisable ticket shop that can be embedded onto your own website- and of course, it’s mobile optimised. Let out your creative side by playing with the colours and images, telling your event’s story in a visually engaging way. Keeping your customers on your own website avoids the risk of diluting your brand image. Need some inspiration? Check out our client stories and note how seamless their ticketing process is. Planning a sit down event? 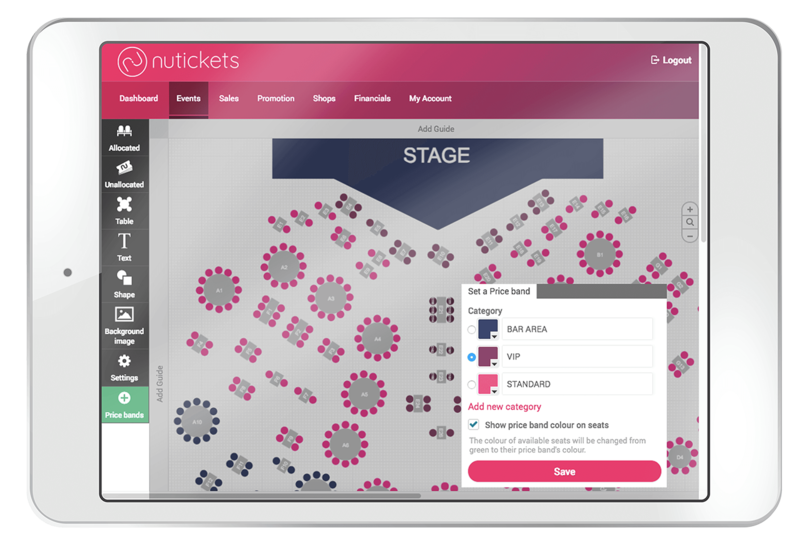 Our software lets you take a back seat when it comes to reserved seating, making it quick and simple to create digital seating charts with as little, or as many price bands as you like. An insider tip to build up excitement around your event is to block out exclusive areas and release them later, this feature is easy to implement with the Nutickets platform. By this stage you should have a clear understanding of your audience, and a fully branded ticket shop tailored to their needs, but why stop there? Strengthen and enhance your offering with added features. Upsell products to your customer as they travel through the checkout process to compliment their event experience. Food, beverages, backstage access and VIP receptions are all tipped to increase market growth in the event ticketing industry (Prnewswire). Nutickets provides this invaluable feature as part of the process. This section will showcase marketing strategies for ticket sales and how to shout about your event- with no megaphone required. A great starting point when it comes to promotion is to sell your event tickets on social media. 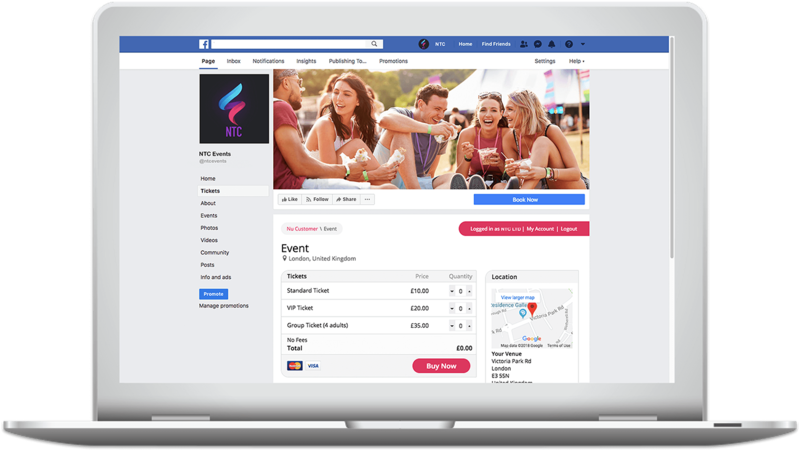 The Nutickets software allows you to seamlessly slot your ticket shop into Facebook, putting it at the forefront of your customer’s conversations and encouraging shares and likes. Another worthwhile method of promotion is through email. Tried and trusted email marketing has been recently overshadowed by the social media boom, however it is still a highly effective way to reach customers. Use Nutickets to supercharge your email marketing by providing a promotional code, your attendees will thank you later. The value of data is now an undisputed topic, the insight that data provides is crucial. Don’t let this valuable data go to waste, Nutickets allows you to ask custom questions, selecting your choice of format from checkbox to text box. Take the confusion out of decoding the data and let the Nutickets software display a detailed profile for each and every customer. 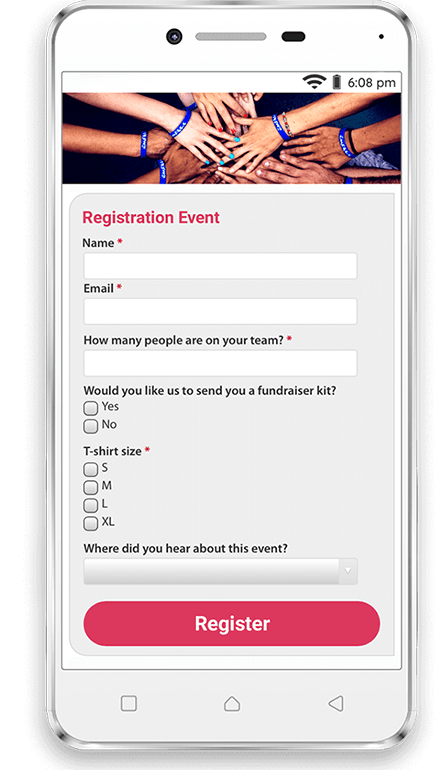 Use the data to send targeted promotions, sharing them with past, present and potential attendees. We know what you’re thinking- does this software comply with GDPR? The answer is yes, absolutely! We’ll provide you with all the tools you need to collect and manage your customer data in line with the GDPR requirements. Can’t wait to get started? We’re eager to help you sell tickets online, let us help you get started by getting in touch here.